Sixteen-year-old Sarah can't draw. This is a problem, because as long as she can remember, she has "done the art." She thinks she's having an existential crisis. And she might be right; she does keep running into past and future versions of herself as she wanders the urban ruins of Philadelphia. Or maybe she's finally waking up to the tornado that is her family, the tornado that six years ago sent her once-beloved older brother flying across the country for a reason she can't quite recall. After decades of staying together "for the kids" and building a family on a foundation of lies and domestic violence, Sarah's parents have reached the end. Now Sarah must come to grips with years spent sleepwalking in the ruins of their toxic marriage. As Sarah herself often observes, nothing about her pain is remotely original--and yet it still hurts. ★ "King's brilliance, artistry, and originality as an author shine through in this thought-provoking work. [...] An unforgettable experience." --SLJ, starred review ★ "A deeply moving, frank, and compassionate exploration of trauma and resilience, filled to the brim with incisive, grounded wisdom." --Booklist, starred review ★ "The presentation of the surreal as real, the deeply thoughtful questions she poses, the way she empowers her teenage characters to change the trajectory of their lives--King writes with the confidence of a tightrope walker working without a net." --Publishers Weekly, starred review ★ "Lack of original ideas is not something found in work by A.S. King, who blurs reality, truth, violence, emotion, creativity, and art in a show of respect for YA readers." --Horn Book Magazine, starred review ★ "Books about abusive families generally follow the problem-novel script of recognition, admission, and solution; in her inimitable style, King takes a totally different tack, exploring (through interpolated sections from Sarah's mother as well as Sarah's narration) the way abuse warps and gnarls a family over time into a thorny growth of anger and denial that becomes a daily norm, even for members who aren't direct victims.... Readers won't have to live with abuse firsthand to recognize the taut, invisible coils of family dysfunction and the difficulty of gaining perspective on it, let alone breaking free." 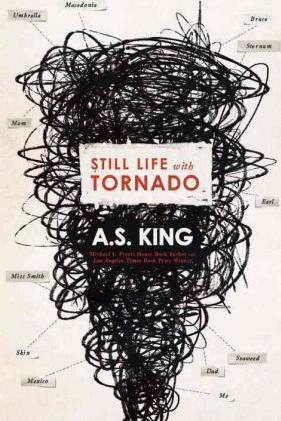 --BCCB, starred review ★"King's ingeniously crafted, deeply engaging Still Life with Tornado will have readers by the collar the whole time." --Shelf Awareness, starred review "King understands and writes teen anxieties like no other, resulting in difficult, resonant, compelling characters and stories." --Kirkus "A.S. King is known for crafting deeply sympathetic portraits of teenagers in crisis, and Still Life with Tornado is no exception." --BookPage "A.S. King has always brought her unique touch to her YA novels, but she may have outdone even herself in Still Life with Tornado." --Bustle "The payoff is great. King's surreal elements are balanced as always by the lucidity of her prose, and her generous, unflagging faith in her readers' ability to keep up with her mental fireworks results yet again in a book that's truly singular." --B&N Teen, "Best YA Books of 2016" "Though touched with magical realism, this is otherwise a wholly contemporary story about a girl who needs to come to terms with her family's toxic and painful history before she can start dreaming of the future." --Bookish: "Fall 2016's Unputdownable Contemporary Young Adult Books."